Curious as to what the “Read & Return” program was all about, I stopped to investigate. In short, this is a program offered by The Paradies Shops, who run stores in ariports across the United States and Canada. 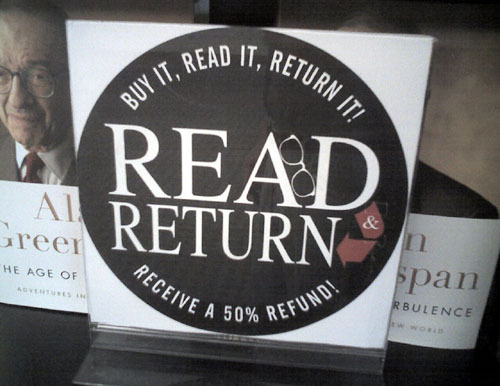 The nuts and bolts of this program are that you can buy a book, read it, and return it (within six months) to any Paradies Shop (that sell books) at any airport for a 50% refund. This program covers all hardcover and paperback books that they sell. While this is the first I’ve heard of it, this program has apparently been around since 2003. The last two books that I purchased, The Four Pillars of Investing and Your Money or Your Life, list for $29.95 and $15.00, respectively, and this is exactly what you’ll pay for it in an airport bookstore. Yet they can had on Amazon.com for just $19.77 and $10.20, respectively. In other words, if you save your receipt, and if you remember to return your bookw within six months, you’ll end up paying slightly less than if you had bought it from a mainstream bookseller. Except that you won’t end up owning the book. In essence, you’re rolling the dice and hoping that you’ll pay nearly as much as the “street value” of the book to effectively rent it, with the alternative being paying way too much to own it. Honestly, if you’re trapped in an airport with nothing to read, you’d be better off buying a newspaper. Is anyone using the Kindle e-reader from Amazon? In addition to letting you download books on the fly with a built in 3G connection (think cell phone but no service fees), which solves the “at the airport but didn’t plan ahead problem”, books are less expensive than their print counterparts. Granted, not everything is available. The two books referenced are not. I’m curious if anyone has an opinion of the device, or insight into cost savings by going this route. When I first started reading this post I was thinking this is a pretty good idea. Yeah, you can look around to get a book for less but when you’re in an airport with a five-hour flight ahead it’s not too bad. Then it occurred to me…when would be the next time I’m around to return the book?!? This might work out for someone who is always flying but if you only take one major trip a year it’s not worth saving the book and hoping to get it back to the airport! I do the same thing as misskate. I did this over the holidays. I did bring something enlightning to read but after being delayed several times, all I wanted was a fluffly romance novel. I don’t need to keep those types of books and I finished reading them by the time I flew back in to my home airport and could just return them. It’s a nice system since I would’ve bought them regardless and this way I can at least get half of my money back. I’ve actually done the read it and return it a few times. I was delayed in Syracuse and am a fast reader. I was delayed so long, that essentially I paid 50% of what they were charging to borrow the book for a few hours to read. On my trip to New Mexico, ABQ airport bookshops don’t participate, so I just returned the books to Dulles when I got back. I’m a big library user and love amazon.com, but buying a fluffy crime thriller or spy novel in an airport is a way that I treat myself. Flying has become such a miserable experience the past few years that this is a way to make it a little sweeter. And since they’re books that I would only read once, being able to return and get some money back just makes it more of a treat. And I use the receipt as a bookmark and that way I don’t lose it. I think this is positive for the environment. Less production, less waste. This program seems to have more to do with with convenience than ownership. And it offers a solution for books that we might not want cluttering our bokshelves. In regards to recycling books, this altenative to the library is an excellent idea. If you love serendipity, you could sign up for http://www.bookcrossing.com and place the book in a location you know someone who will appreciate it finds it. Clearly, if you’re buying a book in the airport, it’s not because you think it’s a better deal than using the library or eBay. Either you didn’t plan ahead and bring a book, or there were delays and other snafus that led to more time in the airport than anticipated. Why on earth would you pay retail price (or half of retail price) for a book you don’t want to own? Just check it out from the library! The only way I can see this coming in handy is if you’re not sure you like a particular book. It gives you a hedge because it lets you return ones you didn’t like or don’t want to keep it after reading it. This might be especially enticing for ppl who buy lots of books. It’s more of a mental reassurance that you COULD return it. I use eBay to run my own similar system. I look for books on eBay, read them, and re-list them within a week or two from the time they arrive. I generally get back what I paid for the book (sometimes minus shipping fees) and I get to read them on my own schedule. As stated the Library is the only thing you need for everyday reading. Some finance books I consider bibles so I want to buy them for reference. When that happens I go to cheapestbookprice.com and they do the work of finding me the lowest price with the best online coupons. FYI I am not affiliated with that site but recommend it for saving a buck. I’ve used this, as these stores are located in airports, when I have not planned ahead and checked out a book from the library. The only problem is if I like the book I keep it for my library. Otherwise it works well, the stores staple a receipt to a book mark with the rules for turning the book back so one is less likely to lose the receipt. Actually I do something similar on my own. I buy books from Borders (they always send me 20% or 40% off coupons). After I’ve read the book, if it’s not something I want to keep, I sell it on half.com. C. Ward: Absolutely. My main problem is that my time is so fragmented that I often can’t make it through a book in the allotted time (even if I renew it). But clearly the library is a great choice. And it costs you nothing at all…right?